This course provides an overview of Social Network Analysis (SNA) and demonstrates through theory and practical case studies how it can be used in HCI (especially computer-mediated communication and CSCW) research and practise. This topic is of particular importance due to the popularity of social networking websites (e.g. YouTube, Facebook, MySpace etc.) and social computing. As people increasingly use online communities for social interaction, new methods are needed to study these phenomena. SNA is a valuable contribution to HCI research as it gives an opportunity to rigorously study the complex patterns of online communication. Social network theory views a network as a group of actors who are connected by a set of relationships. Actors are often people, but can also be nations, organizations, objects etc. 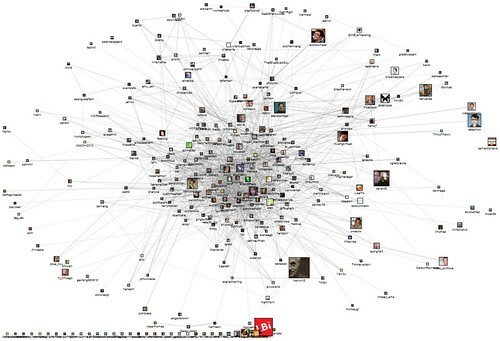 Social Network Analysis (SNA) focuses on patterns of relations between these actors. It seeks to describe networks of relations as fully as possible. This includes teasing out the prominent patterns in such networks, tracing the flow of information through them, and discovering what effects these relations and networks have on people and organizations. It can therefore be used to study network patterns of organizations, ideas, and people that are connected via various means in an online environment. We welcome practitioners and academics interested in computer-mediated communication, universal design, and social software. No background knowledge about Social Network Analysis or statistics is required. Versions of this course were delivered as tutorials at HCII 2007, 2009, Nordi-CHI 2009, INTERACT 2009, the INSNA Sunbelt Social Network Analysis Conference, the 2009 Communities and Technologies Conference and is scheduled to be run this Summer at the Stanford Media – X workshop and the 2009 Social Computing Conference . The content of the course is also part of the Inclusive Design course at the Cyprus University of Technology and has been taught in the context of a class on Communities of Practice at the University of Maryland, College of Information Studies. The course is constantly being revised and modified to account for current trends in this dynamic and emerging research area. be able to derive practical and useful information through SNA analysis that would help designers cultivate more successful online communities. Dr. Panayiotis Zaphiris is the departmental coordinator and an Associate Professor at the Department of Multimedia and Graphic Arts of the Cyprus University of Technology. His research interests lie in HCI with an emphasis on inclusive design and social aspects of computing. More information can be found at http://www.zaphiris.org. Dr. C.S. Ang is a Lecturer at Kent University, UK. His research interests include social aspects of computer games, computer-mediated communication and agent-based simulation of social networks. Dr. Derek Hansen is assistant professor at the University of Maryland, College of Information Studies and the Director of the Center for the Advanced Study of Communities and Information. Hansen focuses his research and teaching on social computing, mass collaboration, consumer health informatics, and information services. This entry was posted in All posts, CHI, Conference, NodeXL, Social Media, Social Network Analysis, Sociology, Talks and tagged 2010, ACM, Analysis, April, Atlanta, CHI, Conference, graph, Media, network, NodeXL, SIG, SIGCHI, SNA, social, Visualization. Bookmark the permalink. Right-click nodes in the NodeXL graph pane to link to lots of things.